A new display at Destination Maternity in Cherry Hill, New Jersey, Monday, February 4, 2019 shows business professional maternity clothes. 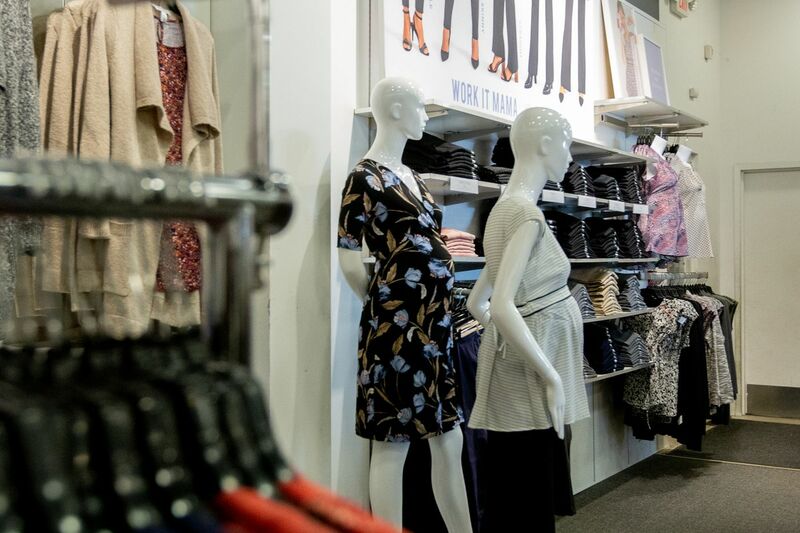 Destination Maternity’s stock price dropped more than 8 percent Tuesday after the Moorestown-based company reported that comparable retail sales declined almost 6 percent in the fourth quarter, which included holiday sales. Investors were skeptical of the company’s turnaround strategy and questioned CEO Marla Ryan, suggesting that they were having trouble believing in the company’s plan moving forward. Maternity clothes overlooked working moms-to-be. Retailers are looking to change that. Shopping for maternity clothes? Here’s what Philly-area moms recommend. “In short, our fourth-quarter results were both challenging and not acceptable,” Ryan told investors Tuesday. She said the temporary government shutdown, the competitive holiday season, and delayed shipments contributed, but added that the company made its own missteps. The company also reported that fiscal year sales fell 1.8 percent from 2017. The company lowered its guidance for this year, projecting comparable retail sales to be anywhere from down 1 percent to up 1 percent, in comparison to its previous November prediction of flat growth or up 1.4 percent. The guidance also changed for total sales, dropping to $370 million to $380 million, compared with $377 million to $387 million. “I’m trying to understand, you know, what progress if any is being made on this restructuring story that you guys laid out because it’s certainly not shown up in the results,” said Jeff Cutshall of Swan River Capital. He pointed out that it seemed that sales were barely covering operating costs and that the company failed to refinance its debt. Ryan responded that she was stuck with inventory that predated her arrival. The company also tested products in the fall to come up with top sellers. It plans to close more stores and intends to push ecommerce, which grew 13.6 percent last fiscal year, she said. Ryan, who took the helm last May after a proxy fight, announced in November that the company’s strategic plan included three priorities: “right-sizing our ship, optimizing our infrastructure, and developing innovative product and solutions." Those goals involve store closures, new product offerings, personnel and technology upgrades, among others. “We’re always looking to find the right experience and talent, and we’re always open to having that conversation,” Ryan told Cutshall in the call. Cash asked whether declining brick-and-mortar sales were caused by an increase in the company’s ecommerce, and the loss of customers to other vendors such as Amazon. The stock fell 19 cents to $2.15 on Tuesday, a drop of 8.12 percent. One investor, Trip Miller, partner of the Memphis-based hedge fund Gullane Capital Partners, said in an interview after the call that he was disappointed by the company’s results. He is looking for positive outcomes that the company may have coming in the next 90 days that would surprise investors or at least give them hope. “If someone would to ask me ‘what’s the catalyst,’ I would say ‘I don’t know,’” Miller said. “This was not a positive report in any way."